Pollen monitoring in Australia has rapidly expanded, particularly in response to needs identified following the world’s most devastating thunderstorm asthma epidemic in Melbourne, 2016. Pollen identification and quantification are integral processes of establishing a standardised pollen monitoring network. A pilot study was designed to assess proficiency in these processes of counters who contribute to daily pollen information at established pollen monitoring sites of the AusPollen Aerobiology Collaboration Network. Counters were instructed to count grass and other pollen along four longitudinal transects of two reference slides at lens magnification of 400×. Participants were asked about their experience, training and usual practice in pollen counting via an online questionnaire. Of the 44 counters invited, 15 consented to participate. Reported pollen concentration values were compared to an approximation of the assigned true concentration values. Overall, 86% of reported values were within acceptable ranges of variation from assigned values. Apparent courting proficiency could have been affected by study limitations including slide quality and high/low pollen concentrations. Although counting performance did not appear to be related to experience and amount of training received, the majority of participants were not highly experienced or trained and the number of participants was small. It was not possible in this pilot study to make conclusions regarding relationships between training or experience and counter proficiency. Evaluation of counter proficiency is an important step in providing more accurate pollen concentrations, which are integral to local daily pollen forecasts for optimum day-to-day management of pollen-related conditions. We thank all participants of the pilot QC study. We acknowledge Mr Marko Simunovic (Queensland University of Technology) for undertaking the reference counting and Professor Ed Newbigin (The University of Melbourne) for providing the reference slides. For their participation in this QC exercise, we thank the site coordinators and pollen counters of the AusPollen Aerobiology Collaboration Networking including members of the NHMRC AusPollen Partnership (GNT1116107), ARC Discovery (DP170101630), Victorian Thunderstorm Asthma Pollen Surveillance and AirRater projects. This study was funded by the Victorian State Government Department of Health and Human Services as part of the Victorian Thunderstorm Asthma Pollen Surveillance project managed by the Bureau of Meteorology. The study was also supported by the NHMRC AusPollen Partnership (GNT1116107). JMD declares that QUT owns patents and patent applications (AU2008/316301; US PTO 14/311944; PCT/AU2015/050348; PCT/AU2014/000630/WO2014_201499) for which she is a named inventor. JMD leads the NHMRC AusPollen Partnership Project (GNT 1116107) with matching cash and in-kind co-sponsorship from The Australasian Society for Clinical Immunology and Allergy, Asthma Australia, Bureau of Meteorology (BOM), Commonwealth Scientific and Industrial Research Organisation, Stallergenes Australia and Federal Office of Meteorology and Climatology MeteoSwiss, Switzerland. JMD is an investigator of the BOM’s Victorian Thunderstorm Asthma Pollen Surveillance Project and has received grants from the NHMRC, Australian Research Council (DP170101630; DP190100376), National Foundation for Medical Research Innovation, the Allergy and Immunology Foundation of Australasia, Asthma Australia, Queensland University of Technology and contracted research grant from Stallergenes (France), in-kind provision of materials from ThermoFisher (Sweden) and services from Sullivan Nicolaides Pathology (QLD, Australia). JMD’s institute has received Honorarium payments and travel expenses for education sessions and conference presentations from Stallergenes Australia, GlaxoSmithKlien, Wymedical, and Meda Pharmaceuticals. PJB received research grants from Australian Research Council Project (DP170101630) and NHMRC Project (APP1116107) and has been consulted/contacted by BOM (2017-2020) and Office of Environment and Heritage, NSW (2018-2019). Other authors declare that they have no conflict of interest. All procedures performed in this study involving human participants were in accordance with the ethical standards of QUT and the Australian Guidelines for Responsible Conduct of Research including the 1964 Helsinki declaration. The study was approved by the QUT Human Research Ethics Committee (1800000161). Beggs, P. J., Davies, J. M., Milic, A., Haberle, S. G., Johnston, F. H., Jones, P. J., et al. (2018). 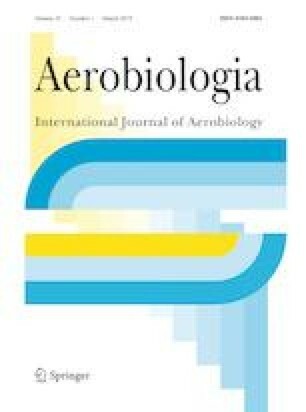 Australian Airborne Pollen and Spore Monitoring Network Interim Standard and Protocols. https://www.allergy.org.au/images/stories/pospapers/Australian_Pollen_and_Spore_Monitoring_Interim_Standard_and_Protocols_v2_14092018.pdf. Macquarie University and Queensland University of Technology. Accessed 03/01/2019.